I’ve worn glasses almost all my life and in November of 2018, I came across a Youtube video by Angie Hepp about how she was restoring her vision naturally. I was intrigued and researched more. I learned about the Bates Method and Active focusing by Todd Becker and Jake Steiner as well other vision restoration techniques. I’m not going to get into it about the differences and techniques but you can do your own research for that. They all had great take away points and all of their techniques work no matter which ever method you go with but they were missing something. I came up with my own way of vision restoration that allowed me to accelerate faster than I ever thought. I’m not 100% clear all the time but when I’m consciously thinking about my vision I can see crystal clear without my glasses at will. I believe everyone should have the right to be free of glasses if they want to. You only have to put in the time and it doesn’t take much work to get it. You can read more about my back story here. Loss of vision is mostly due to a mental block. I’d even say probably about 80% of it is mental. Glasses make our vision loss greater but that’s only 20% of the problem. The longer you wear glasses the worse or lazier your eyes get and because you never addressed the mental you go down a rabbit hole of vision loss. I’ve come to the conclusion that the one reason why we have vision loss, in my case myopia or being nearsighted, is because we mentally block our brains ability to triangulate with our external peripheral vision. This is my own theory and conclusion that I’ve arrived at using my own techniques that allows me to correct my vision almost instantly when I’m consciously thinking about it. In other words when we lose our ability to use our peripheral vision to determine depth of field and distance of surrounding objects in our field of view, we can’t focus clearly on what we’re looking at. If I really needed glasses then why I can clear my vision almost perfectly after a few minutes of concentration? This tells me I never need glasses in the first place I just need to be taught how to use my eyes! I’m sure many of you have heard and seen that we can track a cell phone’s location. 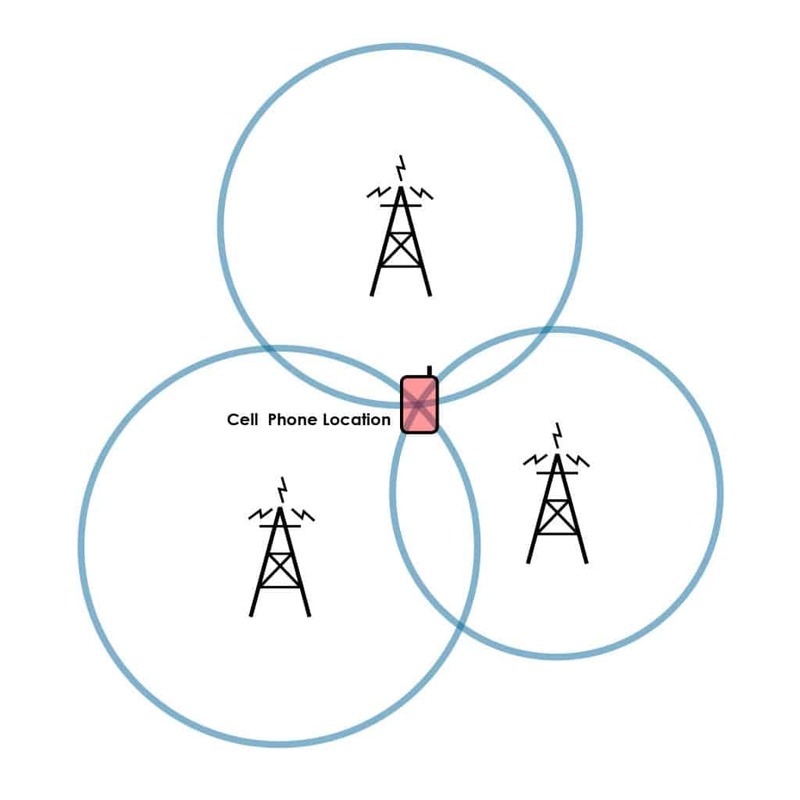 This is done by using 3 cellphone towers to pinpoint the location of the phone in an area or zone. Take a look at this image. I’ve found that our eyes work the same way as cell phone triangulation. We look at stuff with our central vision but we have to use our peripheral vision to triangulate. Take a look at this image. When we want to focus on the center object with our central vision we have to use our external peripheral vision to make the center sharp and clear. We use our external peripheral vision to say to our brain Object 1 on the right is closer to me than the center. Object 2 on the left is almost out of our field of view but still closer than the center. Object 3 in the background is slightly right of the center but way further away. By noticing the external peripheral objects in our field of view but not looking at them directly, our brain calculates exactly how far away the center object is and how to focus the lenses of the eyes to make that object sharp and in focus. It’s really that simple. I discovered this because the more I noticed objects in my peripheral vision the faster my eyes started to focus correctly and sharpen what I was looking at! We lose our ability to focus properly when we stop triangulating with our peripheral vision. The good news is you can get it back by simply retraining your brain and peripheral vision to triangulate. When I consciously do this I see crystal clear close and far! I’m not clear all the time but the times I am clear are getting longer and longer with ease. I no longer need glasses to read at the computer and my distance vision is getting better each day with ease. Some days when I walk outside my vision clears without me even doing anything and that’s because my brain and peripheral vision are starting to work together the way it’s supposed to be in the first place. People who don’t wear glasses do this naturally. Doing this one simple thing is not an exercise!! It’s simply making your eyes work the way they are supposed to work. You don’t need to do any active focusing drills or bates method stuff, you just have to let your external peripheral vision triangulate the way it was supposed to. I no longer do any swinging, palming or sunning from the bates method, or do any active focusing from the Steiner/Becker method. We don’t see 1 thing at a time, you see everything at the same time! I’ve found you don’t have to triangulate with 3 objects but I believe that is the minimum you should be noticing with you’re focusing on a center object. You can always peripheral focus on more than 3 objects and that’s because your eyes are capable of seeing and interpreting the distance of many more peripheral objects than what I originally believed. Where to start and how to Active Triangulate? Start close and then work your way out to greater distances. Set up something similar to the example image I used above. Get close enough to the center object so that it is just out of focus. Then use your peripheral vision to notice the other objects around the center but don’t look at them directly; keep your eyes on your center target object! Think about and notice the peripheral objects in the order of 1, 2, and 3 like the example above. Notice each object in your peripheral for at least 1 second before you move your peripheral vision to the next going in the order of 1, 2, 3 (or 3, 2, 1, it’s up to you), then blink naturally while still looking at the center object. Don’t force the blink or blink hard. Does it get sharper? Sometimes you may have to circle around the peripheral vision objects 2 or 3 times before you blink. After you get this down move slightly left or right of the object and active triangulate again. Keep moving every two or three times you get a sharper center object. 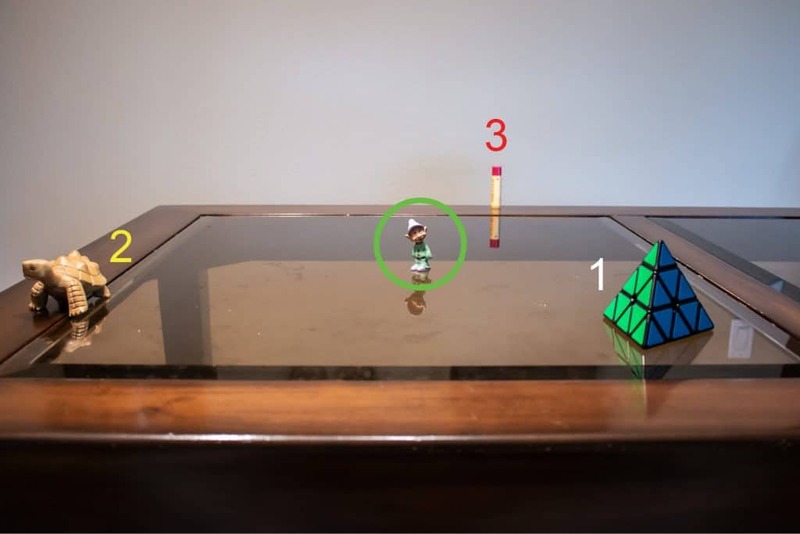 You want to do this so you force your brain to know that the distance of the peripheral objects are changing and your brain will adjust the lens of your eyes to keep everything in focus. If you don’t keep moving you’re going to get vision stuck again because the distance doesn’t change enough! This is why we need to stop staring so much at our phones, the computer or TV! Later, add another object to the scene slightly further away and to the side of the first object and shift between the two while still moving side to side. Sharpen the first object by triangulation, then shift to the second object and triangulate. Shifting between objects or physically moving side to side between every 2 or 3 triangulation cycles is like micro-calibrating your brain’s ability to adjust to small movements of the peripheral objects. This makes the center focus item sharper with each pass. I often focus/triangulation on 1 object and then shift 40 degrees or greater to the next object that is already in my peripheral view. I focus/triangulate on that view and after that, I shift focus/triangulate back to the first object. Sometimes and don’t even blink until I’ve shifted and focus/triangulated between the 2 objects (or more) 3-4 times. When I finally do blink relaxed the focus is way more clear on the original object I started with. If you’re having trouble getting sharper focus move slightly closer and try again. Once you master this with close objects start moving back further and add other objects to shift to. After a while you should be able to focus, triangulate and shift to anything within your arms reach. When you’re ready for greater distances it’s no different than working up close. In a room, focus on something, triangulate your peripheral vision with a minimum of 3 points and blink. Shift your focus to another object that is already in you peripheral vision and repeat. The more you shift to other objects and re-triangulation with the peripheral the more easy you’re making it for your brain to calculate the proper distance to focus the lenses of your eyes on the thing you want to see clearly. If possible try to take a walk outside everyday and do the same thing; find an object, active triangulate with your peripheral vision and blink. Doing this while walking teaches your brain to active triangulate while you’re in motion. There’s a lot more going on while walking but don’t rush the triangulation. Relax and centrally focus on one point at a time while triangulating. Remember to shift your central focus to different objects and don’t fixate on one thing. We get locked up by staring too long at one thing and stopping or blocking active triangulation. If you work at a computer all day put stuff in front, beside and behind your monitor that you can triangulate on. Remind yourself to triangulate often. You may even want to use an alarm or timer. Take breaks when you can and change your viewpoint often by moving from side to side to keep your active triangulation working at an optimal level. You may experience double vision especially if you have an astigmatism or if one eyes sees sharper than the other like me This is normal but if you keep doing the active triangulation it will eventually clear up on it’s own. Clear up the close up distances first and then the objects you look at further away will get better over time. Sometimes when I was doing this I started getting a stinging sensation in my eyes, almost as if someone put salt water in my eyes and blew on them with cold air. My eyes would also start to tear up and sometimes blink uncontrollably. If you can resist the urge to blink and push the stinging you’ll gain almost instant clarity. This is your eyes wanting to release from being locked up. The more it happens then less it will sting and the easier it will be. You may also feel some tightness in your eyelids from time to time. This is due to your external eye muscles re-working themselves. It’s ok and just blink a few times when needed. If you can clear your vision why are you still wearing glasses? As I said above I’ve worn glasses for over 30 years. Glasses have done two things; they have made my eyes lazy and they have elongated the physical shape of my eyes. When your eyes elongate you have to keep upping your prescription every few years to push a focused image back to the retina of the eye. Do some research on how glasses work to focus light to the back of your eye. I now have to retrain my eyes to stop them from being lazy and work as they should as well as correct the elongation damage also caused the glasses themselves! Yes I can get crystal clear images when I concentrate but my eyes (and brain) are working hard to do it. The more I do it the easier and faster it is getting so I know I’m on the right track. I’m fixing what has been done wrong for so long and I think I’m doing well considering the amount of time I’ve worn glasses and the amount of clarity I’ve gotten in just 3 months. There’s one other thing I’ve had to fix and that’s the astigmatism in my left eye. That’s when the lens of your eye is not perfectly round but more football shaped. This causes the light to scatter to the back of the eye and it can make things even blurrier or make you have double vision. Astigmatism correction in lenses refocus the scatter light in your eye back to the center of the retina so you see clear. It can be at different degrees and correction strengths. Astigmatism can be induced by your glasses but it can also caused by a bunch of bad habits. I’ll do another post later on my bad habit that I realized I do and I’m positive that it contributed to my astigmatism problem. My astigmatism lens correction was only a -1.0 which isn’t that high and I found I could do with the correction at all on my lowered prescription. I’m still working to strengthen that eye, but it is way better than it was a month ago. I still have a little astigmatism blur in my left eye but it’s almost clear now. In a few more weeks I’m sure it will be and I’m also working to see at the same strength in both eyes. Don’t work too hard trying to get this. Take a break from time to time by closing your eyes and resting for a few minutes. Also I’ve found when I work at it too long, I take a warm towel and put it over my closed eyes for a break. Wear your glasses as little as possible but when you do use your glasses try to consciously and actively triangulate. You will probably find that your glasses will get sharper and possibly too strong after a while. You may need to even step down your prescription which I had to do several times in a short period of time. I will say it’s a little harder to actively triangulate while wearing glass because the frames of the glasses block some of your peripheral vision, hence glasses make your eyes lazy. It can still be done but it takes a little more effort at first to do it. Your eyes didn’t get this way overnight so don’t expect to fix it overnight either. Be patient and it will happen. I am not a medical professional and I don’t have all the answers to every eye problem out there. If you have some serious eye conditions then seek medical help for that. I’m just a guy who figured something out that is correcting my vision problems that I’ve lived with for over 35 years. You have all the answers above and if you’re nearsighted like me you just need to change the way you look at things, literally. I also believe this will work if you’re far sighted as well. If you send me questions or comments like; will this work for me or I have a prescription of …. can you fix…. or my eye doctor said this doesn’t work, etc, I will probably not respond. I’m also not going to respond to debates on the bates method or other natural vision correction. I know what is working for me and I’m only sharing what I’m experiencing with others so they too can be glasses free if they choose. I can honestly say the first time you experience crystal clear vision without your glasses you’ll want to work even harder so it clear all the time. Your first pop of clarity just shows that clear vision is within your grasp if you are willing to take the journey to get there. Glasses are not necessary for most of us and you never needed them! I remind myself this mentally everyday! Throughout each the day I can achieve perfectly clear vision without my glasses so I don’t wear them unless I need to drive or really focus on a particular task or activity. At the time of this post my current prescription is Left Eye -3.00 with no astigmatism correction, Right Eye -2.75. This prescription is starting to be too strong and I will more than likely have to step it down soon. I started out with a prescription of Left Eye -5.00 Cyl -1.00 and Axis 80 for astigmatism and Right Eye -4.00, prescribed on October 26, 2018. At the time of this post it was just over 3 months ago. I can no longer wear this prescription because it is too sharp and strong and gives me headaches. If you try this and it starts working for you, feel free to post a comment below on your progress. I will certainly keep you all updated on my progress. I don’t know when my clear vision will be permanent but I have a feeling with my mind over matter mentality, it won’t be long!